Our little boy is 2 months old! The time is already flying. The first 6 weeks were all about survival. I had no idea what I was doing, and I could barely function. Emails went unanswered, my hair barely got washed (although I did shower every day), and I felt like I could never continue my old life along with my new one. Then weeks 6-8 happened, and I feel like a new woman. Raffi is starting to figure out what the real world is all about, and I am getting to know him better. It’s starting to become really fun! Raffi is doing so well with his schedule. Some people might think that I’m crazy for waking him up when it’s feeding time even when he just fell asleep, but it works for us. He doesn’t get overhungry, and he sleeps really well at night. We are up to 7.5-8.5 hours of straight sleep a night. ETA: night 7 (11/16): fed 8:30 PM 5.25 hours slept 9:45-3. fed. slept 3:30-7:30. *We had to move to the larger size sleep sack so I think he was wiggling too much and woke himself up. The tighter the swaddle the better! This is a big difference from how things were going a few weeks ago. 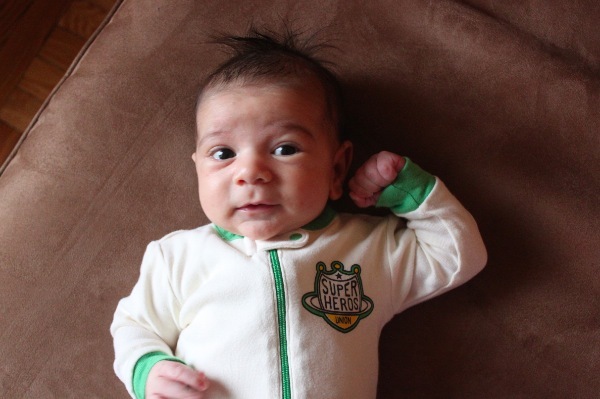 Raffi hated swaddling at week 3, but we tried it again and it worked. Our nighttime routine goes like this: We give him a bath with water only, then snuggle up together as a family for a few minutes if Raffi isn’t screaming for food yet. Then I put him in a onesie only and wrap him up tight in a Miracle Blanket followed by a Halo Sleep Sack + Swaddle. I close the curtains in the nursery, put on the bathroom light with the door cracked and get into the guest bed (in the nursery) to nurse Raffi in the dark and silence. I nurse him lying down and it is his longest session of the day- usually about 30-45 minutes. He starts nodding off and sometimes the next step is easy. He will fall into a deep sleep, I doze off, and 20 minutes later I wake up and lift him quickly to put him in the crib. I turn on the Sleep Sheep and close the door, leaving it open a crack so that the bathroom light gets into the room. Sometimes he will stay asleep, and other times he will wake up crying 2 minutes later. I wait 2 minutes to make sure it’s a real cry and not a quick one like he sometimes does in his sleep, and then I sneak in to pop the pacifier in his mouth. It might take 2 or 3 tries, but within 10 minutes of putting him in the crib he is definitely out for the night. I can’t believe it! Of course I still wake up every hour to check on him on the monitor. He moves a lot during the night but never really wakes up. The next step is to work on naps. As I write this I have him napping in the crib swaddled for the first time. We usually just swaddle at night. I debated starting this habit since the doctor wants us to break all swaddling by 10-12 weeks, but I figured it was worth it if it would give him good sleep and me a couple of hours to work. It only works for 25 minutes at a time, but hopefully it will get better. Any tips on napping with no swaddle, aside from putting him in the car seat? Raffi is on a 3 hour rotation of eating/playing/sleeping. He eats about 6 times a day, and goes to bed at night between 8:45 PM and 9:45 PM. Sometimes he eats exactly 3 hours apart, but usually we start at 5:30 or 6 and work in 2 hour 45 minute increments. He has his biggest feeding right before bed, and his fastest one at 5:30ish in the morning. Breastfeeding is still easy and is going really well. I’m very thankful. We have lots of rolling going on! Raffi now lifts his head up very well and rolls from belly to back all the time. I didn’t know that he would do that this soon, and I love it. On the other hand, he isn’t smiling much yet. He looks really content while playing after a meal, but no big social smiles. I can’t wait for that moment. Raffi finally knows who I am. He follows me around the room, and if I leave for a minute he cries. I love that he is getting to know me and me him. He loves music and loves dancing around with his baba. When he is being really crabby, Trig holds him in a special way and they dance all around and the cries immediately stop. It is amazing. I was overdressing my little penguin, and since he has lots of baby fat he was seriously overheating. Bad momma! He got a bad heat rash on his face and neck from it, so now we know that he likes to be dressed in a bit less clothing than us. He is more happy that way and doesn’t sweat as much. Looks like he takes after me in the heat department because Trig is always cold while Raffi and I are hot. Funny. The startle reflex is still pretty bad. If I put Raffi down unswaddled he will wake up within 2 minutes with punches to his face. Poor guy. The ped said that would disappear by around 12 weeks. PS- Check out my latest Babycenter post on finding the time to exercise. Any more clues on how to get this routine going? Are you following “BabyWise” or some other book/program? I’m in awe and want to figure this out for myself! Yayyy! I’m glad to hear everything is going so well! I just finished telling someone how hard the first six weeks are. You seriously feel like you have 0 control! Y’all are doing awesome with the schedule! Since my days are all so different (based on when I work, when I teach, etc)…I’ve kinda let Kaylin do her own thing. Its working well for us- I think everyone just has to do what works for them, right? That picture of PB and Raffi? Melts my heart! So sad we couldn’t meet up while I was up there! It’s nice to hear things get better after 6 weeks! My baby is only 1 month old and we are still struggling to understand each other, but it is getting better! Raffi looks just like Trig! So cute! Great job Sabrina! Raffi is adorable. I’m so glad you’ve figured out a schedule that works for you and your family. He’s adorable. I love his mohawk hair! So happy things are getting better! He is an adorable little guy! I can’t wait for the social smiles, too!! Hi. First time commenter here, I found this site thru your Babycenter blog and I really enjoy reading. 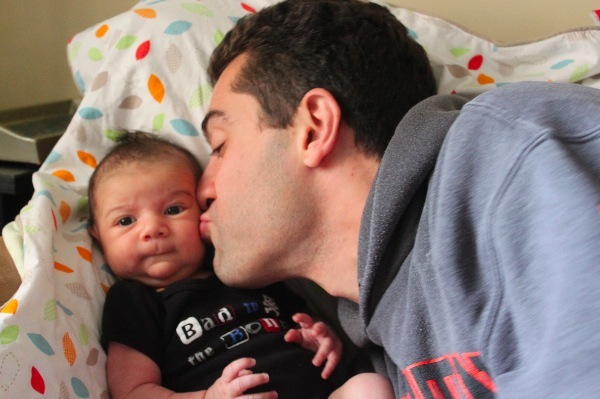 I just wanted to say that I think keeping Raffi on a schedule is the key to making life easier with a newborn. I kept both of my girls (now ages 6 and 8) on a schedule and I really think it makes a difference. It’s hard sometimes, especially when you are so so tired but definitely well worth it. In fact, my girls still have a routine (school, sports, bath time, and bed time, etc) and if we happen to veer off it really affects them. So, great job and you have a beautiful baby! 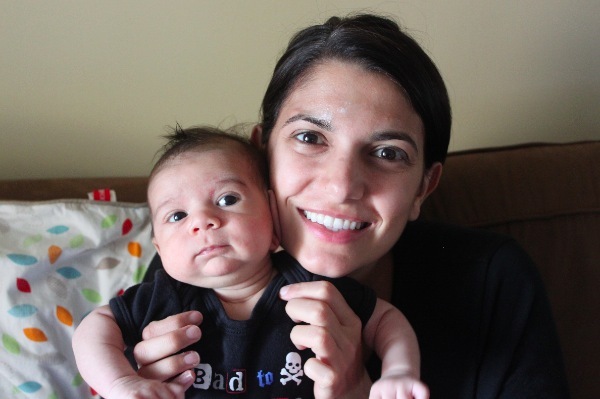 A couple questions for ya- why do you have to stop swaddling at 10-12 weeks? 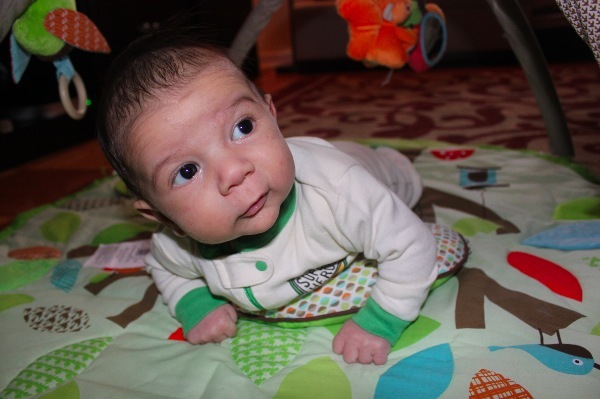 Also, how much tummy time to you give Raffi everyday? I’m so impressed he’s rolling over! H isn’t rolling from belly to back and I feel like it’s because I don’t do enough tummy time. She just hates it! @Brittany (A Healthy Slice of Life), I’m not 100% sure why, but he did mention it in relation to his rolling. He also said thst once his startle reflex lessens it is good for his development to kick and move while sleeping. Tummy time- I am the mean mom. I try tummy time after every single feeding. We play for like 10 min and then I put him on his belly on the mat in front of me while I do other stuff. Sometimes he loves it and other times he gets frustrated fast. When he gets frustrated I place him down with the pillow under his belly and then put thekick and play piano in front of him so he isn’t bored. If he starts crying I help him roll and try again a few min later. I’m guessing he does about 30 min a day since I love watching him so much. Meanwhile, I am still not reading books to him! Sometimes I read an email out loud, but mostly I just talk. he isnt blabbing that much yet! in time it will come im sure. @RhodeyGirlTests, I can kind of answer the 10-12 weeks question, though, I wouldn’t say ALL babies have to. We had to stop around that time because he was getting too big and too mobile. He outgrew the swaddle, but more importantly, he was rolling, and pulling out of it making it dangerous. I found him with it pulled up around his head and rolled over on it. You CAN stop at that point, though, because they lose the startle reflex that wakes them up. It’s interesting that your doctor has a time frame for swaddling. We’re still swaddling and my daughter is now 3 months. I haven’t been swaddling for naps for a long time, but thought about starting again as she has a tough time sleeping during the day for any good length of time! I am not a “mean mom” with tummy time so she is not rolling over yet so maybe that’s ok? She still startles herself when I don’t swaddle during the day! @Tiffany, He said his absolute limit is 14 weeks with swaddling. Every ped has a different recommendation though I’m sure. You know what’s best for your daughter! We are JUST starting swaddling for naps, and I am bummed that I will have to break a new habit so soon. However, he is already rocking back and forth too much swaddled so it is probably a good thing for us to stop in a few weeks. I wouldn’t want him flipping to his belly and getting stuck! Naps were a challenge for us at first, and still are sometimes. We have blackout curtains in the room, we blast the sound machine (Homedics…the waterfall noise sounds like loud white noise) and we are just getting to the point where we are letting him fall asleep without being rocked (still in progress). The key for us was to catch him before he got overtired because then it was impossible to get him down. What a cute little guy! So glad things are going well for you!! What a wonderful update — I love these! 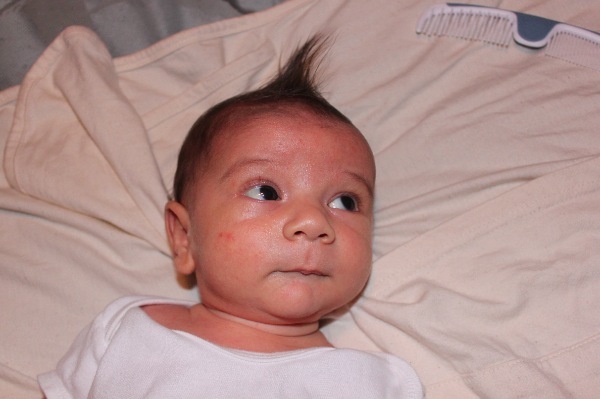 I love Raffi’s hair too by the way. 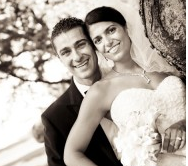 Sounds like your little family has found a great routine that seems to be working! Congrats to you! He is so stinkin’ cute!! RAFIIIII YOU ARE SO LUCKY … YOUR MAMA AND PAPA LOVE U SO MUCH AND YOU ARE CUTE JUST LIKE THEM ! 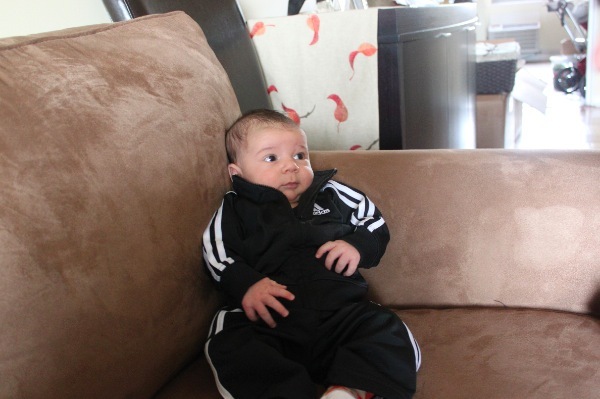 i am DYING at the little adidas suit! i love it! My baby girl is 9 weeks today and hates tummy time. Sometimes we go a couple of days without tummy time (I forget about it) and when I remember, I feel so bad. It’s really rare when she sleeps more than 4 hours at night. I really miss more sleep time for me too. She sleeps a lot during the day, it’s so hard to keep her awake. Does Raffi sleep a lot? You’re doing really good, Sabrina. @Li Frank, Raffi stinks at daytime naps. He probably sleeps 4 hours total during the day which stinks because he clearly needs more than that. Then he sleeps from around 9 PM to 5 AM, 5:30-8:30 AM. Did you try following any type of eat/play/sleep pattern? OMG, that’s so funny! I just came back here because I’m struggling with my almost 6 month old son. He hates napping. He won’t. He refuses. And 5 years ago I wrote that my daughter (then, 2 months ;)) was napping too much. And sorry lol I never noticed that you replied. We’re working now on the night time sleep. We’re putting him down awake. Sometimes he goes down, not a peep. Sometimes he cries for 10 minutes but that’s it. And he still wakes up twice to eat. I can’t believe how much he is sleeping – count yourself blessed!! Nice work! @pupfiction, Thanks pup. We’re going on several days in a row now. Two nights only have been less than 7 in a row- the one mentioned above plus 2 nights ago he woke up at 3:30 AM and was seriously hungry. You all sound like you are doing great! You sound like a much happier, healthier mama now that the little one is getting more into a groove and getting some sleep. I followed you through pregnancy and it’s so fun to see you as a mom. Does Raffi fall asleep after each feeding during the day? Do you wake him up to play or is he already awake? My baby sleeps a lot during the day and always after a feeding. By the time she wakes up, its time to feed again so we’re not getting a lot of play time in. He falls asleep. 4 minutes later he wakes up. He cries for a few minutes until I figure out what’s going on. Either he needs a burp, to be changed, or is still hungry. I lay him on the mat on his back while I have a glass of water, reply to an email, or make a snack/lunch etc. I flip him on his belly. If his belly is too full he cries right away and flips back. I try again every 5 minutes until he does it. Sometimes we do this on my belly, and sometimes on the mat. He eventually starts crying a lot and yawning. I start the process of getting him to sleep. He FINALLY falls asleep only to wake up 30 minutes later hungry. Raffi does NOT stay asleep after a feeding. He rests for a few minutes but then wakes up. For a few days I was waking him up right away to play, but he was a crab so now I give him a few minutes and he wakes right back up on his own. Sometimes he doesn’t fall asleep at all. Thanks for taking the time to answer my comment. Well, baby Claire sleeps more than that during the day for sure. It’s so hard to keep her awake. I even wake her up sometimes for some playtime. I’ll try the eat/play/sleep pattern. Last night we put her in her crib at 11pm. She woke up at 12:30, 4:00, 6:30. She nurses a tiny bit and goes back to sleep. Usually she wakes up at 3:00 and 6:00. She needs to sleep more. And me too. This is killing me. @Li Frank, If she’s not hungry, how about giving a pacifier? I noticed that when he would wake up and only nurse a little bit the pacifier did the same thing and he would fall right back asleep. Also I need to catch him before he is overtired in order for him to know it’s sleeping time. And we use white noise all night so he stays asleep. @RhodeyGirlTests, I tried the paci sometimes but after a lot of fussing, I would nurse her. I think I’ll try harder with the pacifiers. We need put her on a schedule so bad. Last night she slept from 1am to 8am but sometimes she wakes up 3, 4 times. I tried yesterday and the day before the eat/play/sleep pattern and that’s probably why she slept so good. Raffi looks so cute with his shirt.